In Sardinia, an island of Southern Italy, the climate is Mediterranean, with mild, fairly rainy winters and hot, sunny summers, which are a bit sultry but tempered by sea breezes. At sea level, the daily average temperature ranges from about 10 °C (50 °F) in January and February to 25 °C (77 °F) in July and August. The rains are not abundant, in fact they typically fluctuate from 400 to 550 millimeters (15.5 to 21.5 inches) per year on the coast (but locally they can drop even below, for instance in the southeastern tip of the island) and follow the Mediterranean pattern, that is, they are more common in autumn and winter, they gradually decrease during spring, and hit a low in summer, when it almost never rains. In inland areas, rainfall locally exceeds 700 millimeters (27.5 inches) per year in hilly areas, and 1,000 mm (40 in) in the mountains. Here is the average precipitation in Cagliari, the largest city and the capital of the region, situated on the coast, in the southern part of the island. Sardinia is a windy island, especially from October to April. This happens because of the Maestrale, the northwest wind, which blows from France (where it is called Mistral) and affects particularly the western part and the Strait of Bonifacio, but also because of the "Ponente", which blows from the west. In summer, sea breezes blow, but they are welcome because they make the heat more bearable; on other occasions, the "Scirocco" can blow from the south-east, bringing heat waves from Africa, which are felt mainly in inland plains and valleys, with peaks of 40 °C (104 °F) and more. In the interior, the climate becomes gradually colder with increasing altitude, in fact there are hills and mountains, and as mentioned in some areas the rains are more abundant as well, so much so that thick forests are found. 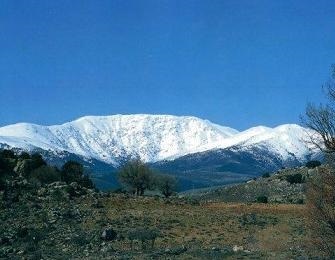 The highest peak, 1,834 meters (6,017 feet) high, is located in the Gennargentu Massif, where in winter snowfalls are quite frequent. The island is quite sheltered from cold waves; along the coasts and in the plains, snowfall is quite rare, but it can occur in the coldest winters (as happened in January 1985 and February 2012), more easily in the north of the island. An exception is Costa Smeralda ("Emerald Coast", see Olbia), in the northeast, where snowfalls, though usually not abundant, are a bit more frequent. Night frosts in the plains are rare, and when they occur, they are light: generally the temperature does not drop below -2/-3 °C (27/28 °F). On the other hand, in inland areas, already at an altitude of a few hundred meters (see Nuoro, Macomer, Tempio Pausania), snow is relatively more frequent and abundant. Here are the average temperatures of Alghero, located on the coast, in the north-west of the island. On the small islands and the most exposed coasts, the climate is particularly mild. 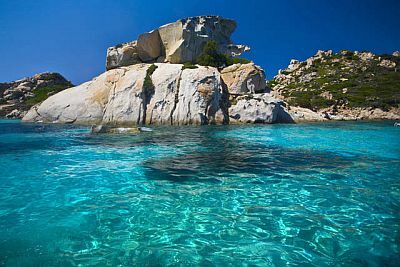 Here, for example, are the average temperatures of Guardiavecchia, on the island of La Maddalena, where 470 mm (18.5) of rain fall per year, with a maximum in December of 75 mm (2.9 in) and a minimum in July of 12 mm (0.45 in). In inland plains, the climate is slightly more continental. 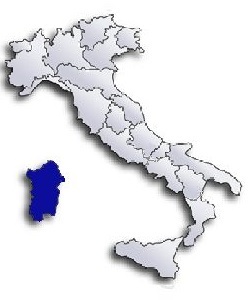 Here, for example, are the average temperatures of Decimomannu, about 20 kilometers (12 miles) north-west of Cagliari. As we mentioned, at higher altitudes the weather gets colder. Here are the average temperatures of Fonni, located north of Gennargentu, at 1,000 meters (3,300 feet) of altitude. The amount of sunshine in Sardinia is very good in summer, especially along the coast, when clear skies prevail, while it's not so high from November to February. However, some sunny periods can occur also in winter. Here are the average daily sunshine hours in Cagliari. The temperature of the sea is fairly uniform on the island, and just lower in the western part; the sea is warm enough for swimming from July to September; in June and October, it's instead a bit cool. Here, for example, is the sea temperature near Porto Cervo, on the Costa Smeralda. For a beach holiday, the best time to visit Sardinia is summer, from June to August. The sea temperature is comfortable enough from July to September, although in September, which in any case is still a good month (especially in the first half), the first periods of bad weather occur. In June, as mentioned, the sea is still a bit cool, while in May it's even cold, and sometimes the air can be a little cold for sunbathing as well. April and May are advisable for hiking and for visiting cities, while in summer it can sometimes be too hot to get around with ease. In October, temperatures are mild or pleasantly warm, but the days are shorter and the weather can be rainy and windy.